In this Q and A, the talented Khalifa talks about how she became interested in issues of racial justice, her work with the Dream Defenders, and the power of social media. This graphic came from the images out of Ferguson, Mo., where protesters with their hands up were met with tanks and tear gas. 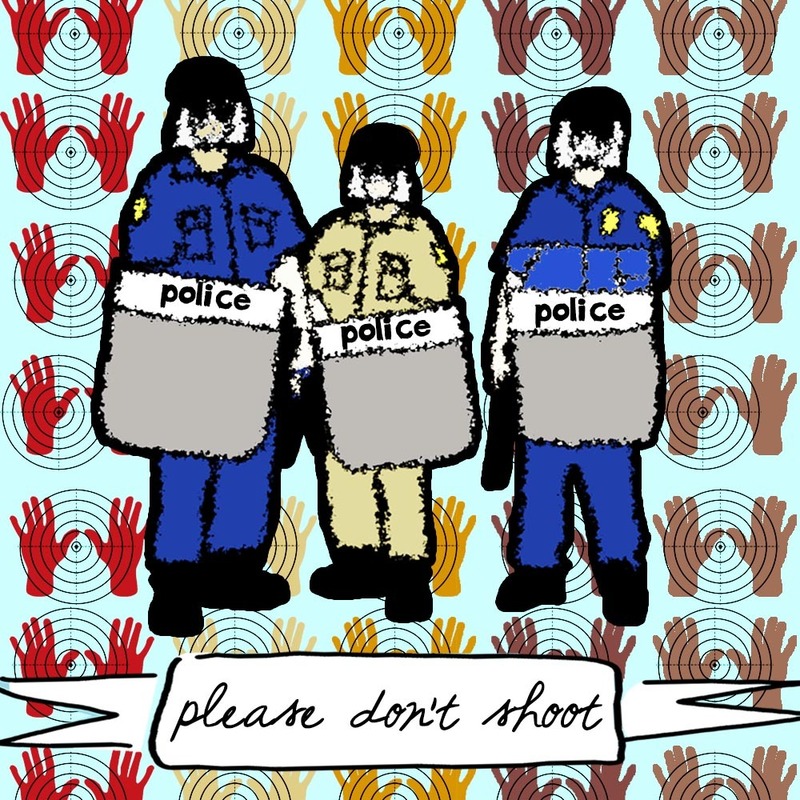 Image courtesy of Waging Nonviolence / Sandra Khalifa. A new civil rights movement is being born—one revitalized and led by young people of color who are fed up with racial injustices. One of the groups responsible for this rebirth is the Dream Defenders, an organization that takes its name from protecting Martin Luther King Jr.’s powerful dream of a world of racial healing and justice. The Dream Defenders rose up in response to the murder of Trayvon Martin. Outraged that George Zimmerman hadn’t been arrested for killing Martin more than a month after the shooting, the first Dream Defenders marched 40 miles to Sanford, Fla., the town where Martin was killed, and surrounded the local police station for a day of protest. Three days later, the police arrested Zimmerman. The Dream Defenders continued to rise to national prominence, organizing a 31-day sit-in inside the Florida state Capitol after Zimmerman was acquitted, demanding an end to Florida’s racist “Stand Your Ground” laws. The Dream Defenders continue to be a voice of outrage and power for young people of color and their allies, not only in Florida, but across the country—forming national demands in the wake of Michael Brown’s shooting in Ferguson, Mo. They were born in the wired age where tweets can turn out thousands and memes can shift the tone of how a movement is perceived. And bold design is an area where the Dream Defenders have excelled—from wearing T-shirts that say, “Can We Dream Together?” to launching online posters of murdered young black men and women that spread to hundreds of thousands of people, showing the world that we are indeed not living in a post-racial society, and that we need to do something about it. I spoke with Sandra about her background and her work with the Dream Defenders. Sandra Khalifa. Photo courtesy of Waging Nonviolence / Kevin Banatte. Joe Solomon: Where are you from? Tell us about your home, and a particularly searing experience from growing up that informed who you are and what you fight for? Sandra Khalifa: I’m from San Clemente, California. It’s a small beach town about two hours from the state’s border with Mexico, where the population is overwhelmingly white, wealthy, and dependent on an undocumented underclass. Being a first generation Egyptian-American, I soaked up the hostility like a sponge and in many ways turned it inward on myself. I had a very blessed and beautiful childhood, but I also witnessed implicit racism firsthand, and learned to feel lesser than my peers. I struggled with feelings of depression and isolation, which I didn’t quite comprehend until I grew older and left Southern California. I came up with things I thought were moving or beautiful to explain complex issues. In terms of one searing experience, I always think about this high school graduation party I attended in 2007. All the top kids in our class attended with their parents, except for one of the top five students in the entire 12th grade, who happened to be Latino and undocumented. He was one of the hardest working students I knew. I remember walking past a group of parents whose kids I considered close friends, who were discussing the highly contested “Triton of the Year” award that’s given annually to a top student. My undocumented friend and classmate had been a final contender, but another of my friends won. As I walked by the circle of parents, I remember hearing one say “I’m just so glad HE didn’t win … he’s not even an American citizen.” It made me so angry, and always stuck with me as a representation of the subtle racism I was surrounded with growing up. Solomon: How did you get involved in design and storytelling work? Khalifa: A couple years ago, when I had already started doing social justice work, I hit a rough spot. I was 22, living in Brooklyn, had little on my resume and couldn’t find a gig for four months. I started volunteering to do graphics for the first Student Power Convergence in Ohio. Back in those days, I was so new to design that I’d make graphics in Powerpoint and take screenshots. After that, I was hooked. I loved being able to express the ideas and issues I felt moved by every day, visually. I taught myself how to use Photoshop, started drawing more and it all came together from there. Solomon: What’s your role at the Dream Defenders? How did you get hooked up with them? Khalifa: Last year, when the Zimmerman verdict dropped in July, I was living in New York and doing media work at Planned Parenthood Federation of America. I have always been passionate about racial justice, so the verdict left me sick to my stomach. I remember feeling like I’d been pushed over the edge. So I got on a plane to Florida and joined Dream Defenders at their sit-in in the Capitol. I was so sad to leave after the first weekend that I came back again the next weekend. Then I flew back to New York and put in my two weeks notice. I felt like Dream Defenders was one of the most authentic, powerful movements I’d been a part of, so I moved down to Florida and became co-director of communications in August 2013. There I did basically all things communications—our social media, including Twitter, Facebook, and Instagram, as well as campaign planning and graphic design. The graphic design aspect was always most exciting for me. With campaigns like#VisitFLand #NeverLovedUs, I got to use my creativity freely and just come up with things I thought were moving or beautiful to explain complex, heavy issues and policies. 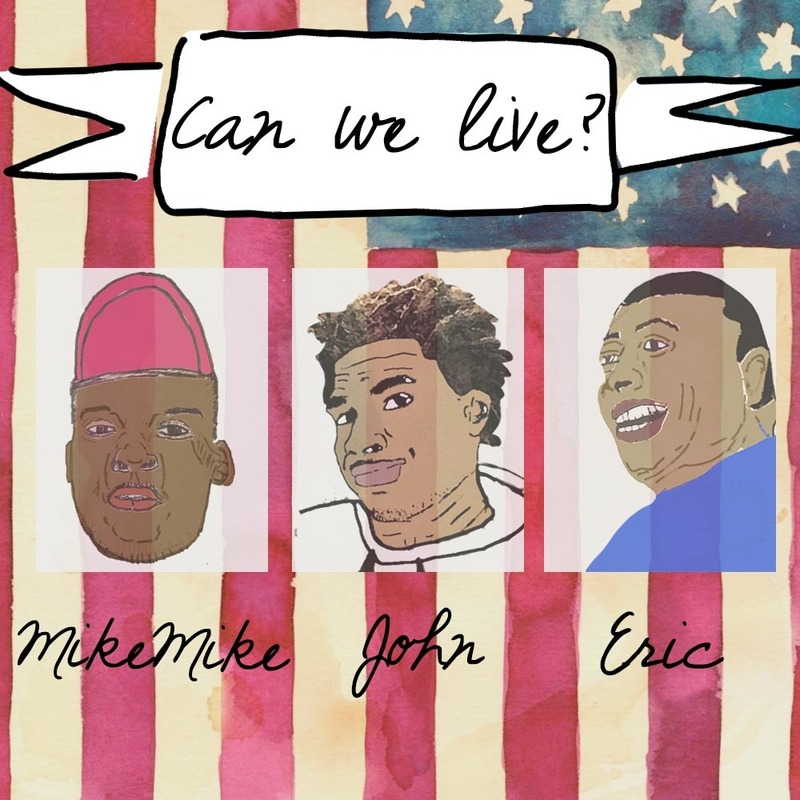 This graphic came out of Freedom Summer 2014. Image courtesy of Waging Nonviolence / Sandra Khalifa. Solomon: Can you talk about how social media played a role during the 31-day sit-in? Khalifa: Social media was essential in the Capitol! There was always so much going on, whether it be workshops, trainings, special visitors, or even church on Sundays. Social media was a tool to show the world what was happening, keep them updated about how they could help or what they could do, and to define Dream Defenders’ goals and identity in a media storm that threatened to mislabel us. Solomon: What examples or stories come to mind where innovative use of social media or powerful design helped bring more support to the sit-in? In a state like Florida, Dream Defenders are always busy. Khalifa: The Dream Defenders “profile”-style graphics definitely came out of the Capitol, which became a big tool for us in my year there. In August 2013, while we were still in the Capitol, unarmed teenager and artist Israel Hernandez was tasered to death by Miami Beach police officer Jose Mercado for tagging a boarded-up McDonald’s. I put together a graphic with his picture and a brief description of what had happened to him, and it really spread on social media. People weren’t getting this information anywhere else, and it put a human face to something the news either ignored or twisted. I think showing that kids like Trayvon and Israel were real people, with families really resonated with our audience. Solomon: Could you talk about an example of how you used social media to bring tangible aid or power from the country to Florida’s Capitol? Khalifa: Another big social media moment in the Capitol is what we at Dream Defenders like to call “Foodgate.” Basically, on the weekends we went on lockdown. Nobody was allowed to enter the Capitol after 5 p.m. on Friday until Monday morning. You could only exit. One weekend, our usual supporters were trying to bring food to the large group of youth and kids sleeping in for the weekend. They were barred from entering by Capitol police. When we casually blasted that information out on Twitter—with images of kids chanting “FOOD! NOW!”—it was like the whole country responded in a matter of minutes. Within 10 to 20 minutes, the Capitol police’s office voice mail inbox and the governor of Florida’s inbox were completely full with messages from people around the country demanding food be permitted into the lobby. On the one hand, it was great because it showed the Capitol politicians who they were dealing with; it was definitely the first big test of our social media reach and presence. At the same time, it kind of distracted people from our main message. When we realized that Foodgate had become a much bigger crisis on the Internet than it was in real life, we came back with a statement saying that no amount of discomfort would deter us from our main goal: getting a special legislative session to discuss Florida’s Stand Your Ground law. It was a big learning experience that with any large audience comes the burden of choosing your words and causes wisely. Solomon: The Dream Defenders’ Facebook page has some of the most powerful portraits I’ve ever seen of movement leaders and people of color who have been victims of an unjust system. I’m thinking of portraits you’ve made of people from Ella Baker to Renisha McBride to Andy Lopez. Can you talk more about the inspiration and process that goes into creating these portraits? Khalifa: Wow, thanks so much! One thing that was amazing about Dream Defenders is that we are all young, inexperienced, and a little crazy. I always had as much creative autonomy as I wanted. So a lot of the designs you mentioned just came from the heart. I basically took people, moments, or news that moved me and thought about how I wanted to convey them. One thing we always felt strongly at Dream Defenders is that we stand on the shoulders of giants. So I often was inspired by different civil rights leaders like Maya Angelou and Yuri Kochiyama, and authors like James Baldwin or Gabriel Garcia Marquez. I liked to bring that cultural aspect to our social media and remind people of some of the greats who came before us. Solomon: I love how The Dream Defenders builds powerful online-yet-grounded, Twitter-wired, culture-changing campaigns. What has been one of your favorites? Khalifa: One of my favorite projects at Dream Defenders was #BlackedOutHistory. As Black History Month approached, I had a conversation with our executive director Phil Agnew. We talked about how we wanted to do something different than the same old, same old—honor different stories and people who have been forgotten rather than the same few legends. From there, we went to all our Dream Defenders throughout the state and even several partner organizations representing different issues, and asked them what they thought was important forgotten history. That’s how we got our 28 days of history. A lot of the designs you mentioned just came from the heart. From there, I got to split up design work with four other awesome Dream Defender artists—Kevin Banatte, Steven Pargett, Jabari Mickles, and Daniel Agnew. We each created art that corresponded with the history. The campaign ended up doing really well, which was exciting. We got to have an art exhibit in Washington, D.C., which was my first-ever chance to display my graphic art in real life. And I recently found out that my Yuri Kochiyama print might appear among other designs in a book honoring her life of activism from the Smithsonian Asian Pacific American Center. Solomon: What’s next for the Dream Defenders? What are you getting ready for and how can folks participate? Khalifa: In a state like Florida, Dream Defenders are always busy. Right now the focus is on Freedom Summer—the 50th anniversary of the 1964 Freedom Summer—which has had Dream Defenders hosting Freedom Schools on civic engagement and issues important to black and brown communities throughout the state. They’ve also been doing some get-out-the-vote outreach through the organization’s first fellowship program, the BLOC is OURS. If you’re near or in Florida, sign up to help mobilize people toward the polls on November 4. And wherever you are: Help us magnify our national demands following the murder of Michael Brown. Solomon: What’s next for you? Khalifa: I’ve recently transitioned out of my role at the Dream Defenders and will likely be migrating back to California. I’m still designing—especially in light of all the recent violence against youth of color, including Mike Brown, John Crawford, Ezell Ford—and can be followed on Instagram. I hope to just continue following my heart, practicing art and doing communications with different organizations who work on racial and economic justice. Joe Solomon wrote this article for Waging Nonviolence, where it originally appeared. Joe is an organizer with the youth-focused environmental justice group Energy Action Coalition, and lives in Charleston, W. Va. Follow him on Twitter at @engagejoe.